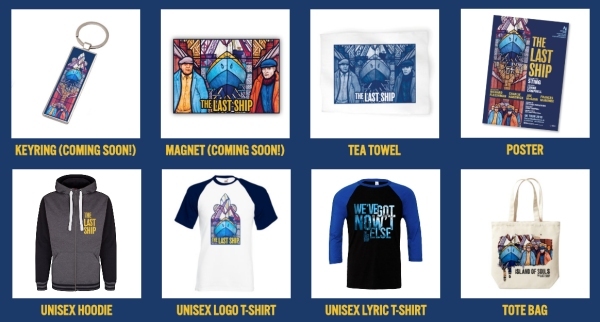 A range of merchandise for The Last Ship is available both in theatres and online at The Theatre Shop. There are a couple of t-shirts, a hoodie, tote bag, poster etc. with a few additional items to come. The Stage: The Last Ship a "Tour de Force..."
It has been something of a rough journey for Sting’s debut musical The Last Ship to end up docked on Tyneside, its spiritual home – including a truncated Broadway run and a last-minute change of cast with the departure of local legend Jimmy Nail, who was in the New York production..
NE Theatre Guide: "Sting's ship comes home at last..."
Northern Stage are having a cracking year in 2018 and with The Last Ship, the Newcastle theatre realises its potential. Not known for musicals, the venue has taken the music of Sting and crafted a show that hits the spot. It is a real call to arms and The Last Ship celebrates the communities that lived in the shadow of the ships that were built along our coastline..